an evening exploring the Metaverse. With VR and Augmented Reality projected to hit $150 billion in revenue by 2020, emerging Bay Area companies are at the forefront of building the Metaverse: a new form of presence. 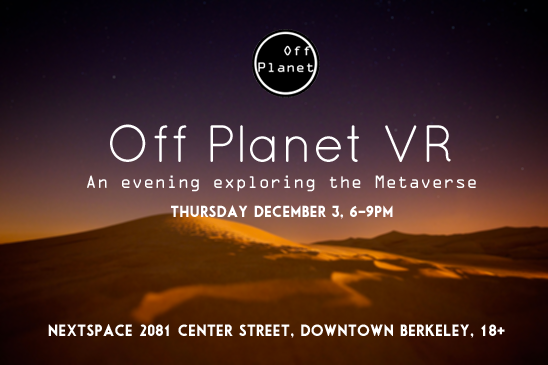 Off Planet VR is a free 3-hour exploration of virtual reality and 360 experiences from the architects, developers and dreamers of this radical new territory. Off Planet is produced by Quirkeley’s Executive Producer, Siciliana Trevino and sponsored by the Berkeley Startup Cluster. RSVP at offplanetvr.splashthat.com. Attendees must be 18 and over. Off Planet VR is produced by Quirkeley, Berkeley’s fresh, local and organic video source and Griffo Project Productions. Sponsored by Berkeley Startup Cluster. Subscribe to Quirkeley on YouTube, follow us on Twitter and like us on Facebook.